An interaction vs a reaction between an adult and child, whether it be a parent, teacher, nanny, family or friend is a subject that is vital to appreciate. The first interactions between a child and adult will build a rapport for how they will continue to treat each other in the future. Are your interactions empowering your child to learn, make decisions, problem solve, just generally build resilience or are you reacting by still doing everything for them? I know I’m guilty of this at times. Instead of trying to interact sometimes as a parent we tend to just react or do everything for children. In our busy lives we try to be overly efficient have everything completed and finished before we have even started. This is where we need to have interactions with our child. For the child to learn a new skill, we, as parents, teachers, guardians, nanny, carers, need to educate the child on the process. Even if it is something as basic as getting their own drink, choosing a piece of fruit, putting honey on their own toast, dressing themselves, making their own bed, clearing the toys up and many more activities. Let’s say a teacher doesn’t allow a parent to come into the classroom each morning. As a parent you are devastated and feel ‘ohh they are just a baby, who will help him’. However the child is probably old enough (4 yrs is old enough!) to walk in by themselves with their belongings, put their school bag in their cubby hole, water bottle where necessary and books on the shelf. Believe it or not, it empowers a child to make decisions, manage their independence, show the teacher they are ready to learn. The teacher is teaching the child to be independent. However if a teacher allows the parents in the classroom it crosses the boundary where the child isn’t independent, isn’t making decisions then reacts like this with tears, tantrums, not knowing where things belong, not ready for their day to learn. Recently I had an experience with a child who wasn’t building a rapport with someone that is important to their life. Whilst the parent is working they look after the child for 1-2hrs in the afternoon. At first I couldn’t figure out why so I observed the way they were behaving with each other: instead of interacting, she would react to whatever he said which resulted in doing everything for him. He had gone from knowing where the cups are put to get his own drink of water to suddenly demanding, ‘I want water, now’. This resulted in his reaction to treat her like that with everyday activities. The parents were horrified by such a swing in behaviour but realised this was due to the minimal interaction between them. Seems quite logical: they hadn’t built rapport or interacted with each other. Instead he decided to push the boundaries. He wanted to become “the boss”. In my eyes, this isn’t building an independent, resilient child. Rather, it is taking away his independence, opportunities to empower him, problem solve and make decisions. This picture was posted by Simon Sinek, the author. 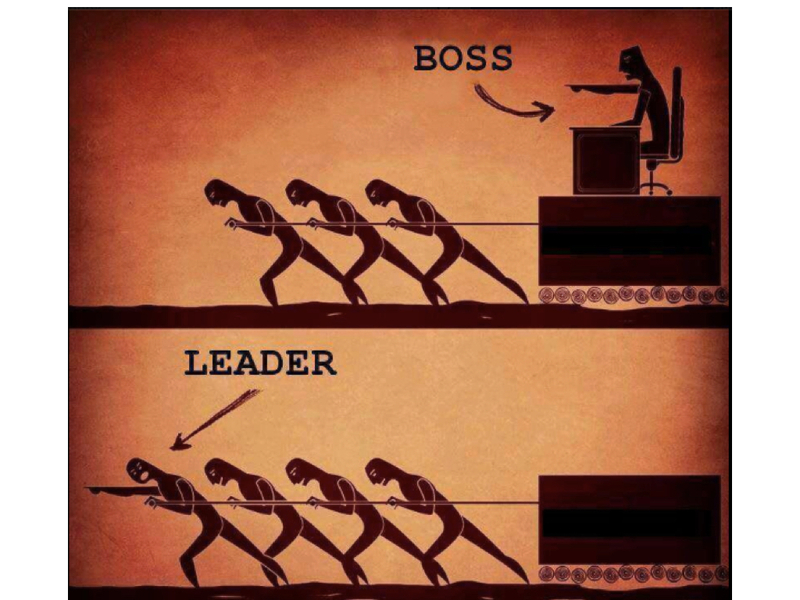 It represents the leaders we want to build out of our children, a leader empowers others to complete a task where as a boss reacts and demands. Next time you are getting your child dinner, playing a game or even dropping them at school, look at the process you take and see whether you are empowering your child to learn, make decisions, problem solve, generally build resilience. Or are you doing everything for them? This objectivity becomes an eye-opener for everyone involved. Next Post Messy Play in the Early Years! All the parents and other adults who are the take careres should read ! Thanks. Jhansi, thank you for the support I would love to hear your experience with this in the early years. I really like the interaction vs. reaction phrase. I think it could really be extended to not just about raising an independent child but about what it means to have relationships in general. What it means to not react to children (and grown ups) with our knowledge of ‘what is right’ , but to interact with them in a way that meets them where they are to explore and learn with them. Reactions bring preconceptions of what the child is supposed to be and not what the child is. Perhaps interactions can develop relationships that are mutually respectful instead of one’s based on a fight for control.